Ficarra Jewelers offers fast, expert repairs to all types of jewelry, including chain soldering, ring sizing, and stone setting. Our bench jeweler has many years of experience with all types of precious metals and gems. 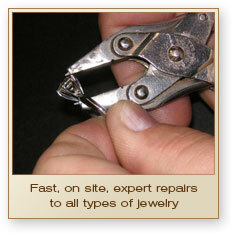 We replace missing or damaged stones, retip prongs, and tighten loose stones. Most repairs are done within one or two business days. We can clean and polish your fine jewelry while you wait.